If I could make language simpler I would. equals sign that extends through each of us . . . . When I was twelvve years old, I accidentally shot a robin, high in a tree, with a BB gun. I think that I wrote something trying to understand how this happened. I’m sure that the piece was not very good, but I learned then that writing was both a way of thinking and feeling. I think that I’m influenced by a lot of different artists, not only poets, but some important influences have been works by Caravaggio, Dante, Keats, Rilke, Dickinson, Rimbaud, Bonnefoy, Camus, Lagerkvist, Stevens, Bishop, and Milosz. I’m also very interested and have written about the work of Ashbery, Merwin, Anne Carson, Jorie Graham, and Mary Ruefle, but my influences probably come more from music and visual art. I’m very drawn to the immediacy of truth in music and visual art. I’ve also spent a great deal of time in the natural world, hiking, exploring, and I built a house in the mountains of Colorado where I live part of the year. I taught at the Cleveland Institute of Art for several years, and I have written a great deal about contemporary painters. I have also worked with animals, which I consider a great influence in my work—the immediacy and power with which they communicate, often through silence. I remember wanting to be a fireman, perhaps because my grandfather was a fireman and he let me slide down the firehouse pole when I was five. I was a very spacey kid, in turns distracted and obsessed. I spoke mostly to my dog, Elvis. “Human Pageant” obsesses with language and the need for equality among people. Language is a great equalizer, but anyone who has ever been to a foreign country and does not know the language gets a sense of what it might be like to be illiterate. The horrible, social isolation of it. I would like language to be simpler, more vowel-filled so that it mimics the mewls and moans of those animals from which we evolved, those animals that still live in the paradise from which we were exiled. As I say in the poem, I want language to be an “invisible / equals sign that extends through each of us / toward the horizon . . . .” Language has the higher power to create harmony, but is often recognized for inciting dissonance and hatred. The house that I built on five acres in the mountains of Colorado. I love classical music, jazz, contemporary music but I never listen to anything when I write. Silence is very important to me. I’m finishing a tenth collection of poems, entitled Shimmer, and a new translation of Rimbaud’s Selected Poems. 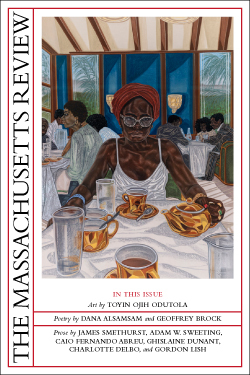 Rimbaud, Denis Johnson, Dickinson, Komunyakaa, Graham, Ruefle, and this wonderful issue of the Massachusetts Review—in part about truth, which I’ve always believed is one of the most important aspects of a work of art, but difficult to define. Truth is the splash of light that ignites us, but also the splash of light that infinitely lingers. Defining it is like defining a cloud. 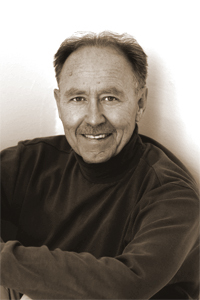 MARK IRWIN is the author of nine collec­tions of poetry, including A Passion According to Green; American Urn (Selected Poems 1987-2014); Tall If; and Bright Hunger. His collec­tion of essays, Monster: Distortion, Abstraction, and Originality in Contemporary American Po­etry, was published in 2017. He teaches in the PhD in Creative Writing & Literature Program at the University of Southern Cali­fornia.